Only have one problem: when I velcroed the battery to the monitor's back, the Component input picture disappeared! I was horrified, cause I thought the monitor just broke down - but removing the battery cured it. Lack of electro-magnetic shielding, or what? Yes, I have the Tekkeon 3450 and the 3450-10 "myPower ALL Plus" power extender working together with Manhattan LCD. I'll try placing the battery closer the next time I use it. Please do, Gints - and let me know. TIA. Also, many thanks to Alex. I tried my Tekkeon pack with the Manhattan HD monitor. I held the battery pack to the back of the monitor in vertical and horizontal orientations and even flipped the battery to match the opposite surface. No troubles here. Sorry I didn't get back to you about using the Manhattan LCD outside in bright sunlight. I just never had an opportunity to do it until this morning. Like you've reported, it's difficult to see anything in bright light. I'll try a monitor hood, but I have my doubts if anything but a full monitor enclosure will help. That page doesn't say much about the hood - how should it be made/attached to monitor? No doubt, you are creative with the accessories. What material do you use for the hood? I'm thinking of cutting up a larger hood that I used to use for a CRT. you always find cool gadgets :) I better watch your moves. Could you please post a photo of this Manhattan LCD once arrives, mounted with your rig - so i can assess how big it is? I might consider buying one if not too large - its price is definitely tempting. Please post your experience with its picture quality, too. 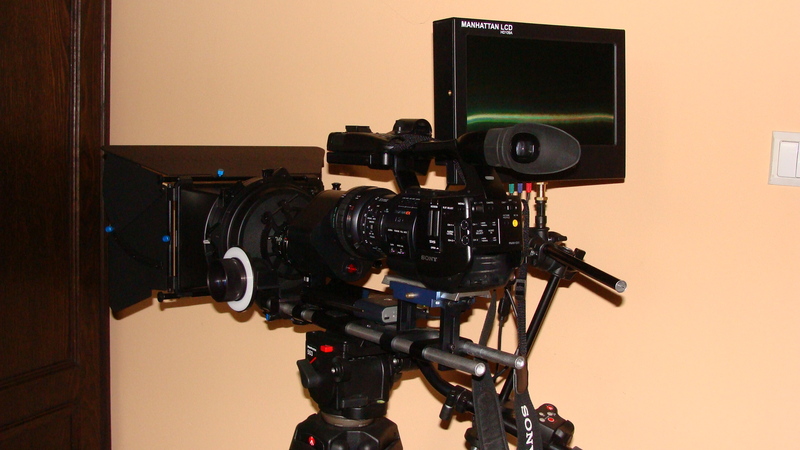 As to my opinion on the depicted rig, I'd say that the Redrock Micro stuff is indeed of an exceptional quality, with equally great support from Brian Valente (and others on the RR forum). The Manhattan monitor is also very, very good (as is the Tekkeon battery powering it), and the support from ManhattanLCD's John Reed outstanding. So now the only missing thing I'm still waiting for is the NanoFlash - Mike, I'm counting on you! Last edited by Piotr Wozniacki; October 30th, 2008 at 04:31 AM. I had major issues with edge softness with the RedRock M2 on a Sony EX1 and either the Nikon 85mm f/1.4 or 50mm f/1.4 set to f/2 . Piotr, I assume you are referring to the backfocus adjustments, which are badly engineered on LEX - in which case I agree with you! As I wrote several times already in other threads, the image quality I'm getting with the improved Letus achromat for EX1, and my Canon lenses, is marvellous. If I'm not totally satisfied is that a precise opto-mechanical device like this, sitting between your high-quality lens and an even higher-quality camera, should absolutely be built better than the Extreme version is. The back focus adjustment is a real pain; even if you succeed in getting it to focus at infinity, the GG can change the amplitude and frequency of vibration, making such noise that shooting with an onboard mic is simply impossible. Also, the way adjustment is done will never ensure that you will leave the GG planar with the camera imagers (i.e. normal to the lens axis). This causes picture softness in one corner or even the whole (left or right, upper or lower) extremity of the frame. But above all, the adjustment won't keep - the three GG stands will sooner rather than later change their position in the rubber bushes, and you will lose back focus again, or the noise will increase, or the critical focus will not cover the whole frame - or all of the above... This happens to me constantly; heck - this thing should have a precise, repeatable and permanent adjustment! Finally, the way Letus Extreme is attached to the thread ring on the camera lens is just pathetic - unstable, flimsy, and above all, unrepeatable. The only contact is the shallow flange, and those pathetic three little screws to keep the 2 heavy and expensive pieces together (camera + adapter) - even on rails, this simply cannot be stiff and precise enough a connection! What I'd expect here is a much longer (or should I say, deeper) contact, and a connection secured by a solid, threaded muff. Last edited by Piotr Wozniacki; October 30th, 2008 at 04:13 AM. To my knowledge, LEX is $1.1K and Ultimate is $4.5K, so there's over 4x price difference actually? Yep. My mistake originated from the fact, that - without a second thought - I compared what I actually paid for importing LEX (+ FedEX shipment + duty + VAT), with the net list price of the Ultimate. So it's even worse, actually. Uh Oh! Looks like a DIY monitor hood tutorial is being requested. As if I have time. I do owe this forum, where I'm a newbie , at least one freebie before the year is over so look for a tutorial here in about 3 weeks. The handy amongst you will know what to do from that, all else will get theirs when I get some bandwidth! Yes, this is definitely necessary outside. 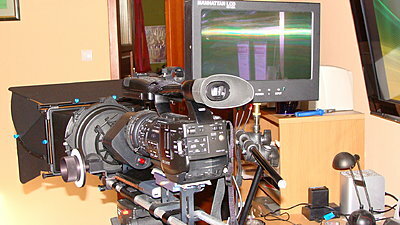 My Sony EX1 LCD does a better job in early morning light while the Manhattan LCD is rendered useless by glare. I'll look into getting a hood for the Manhattan and that Hood sock for the LCD. The EX1 viewfinder is now too fuzzy compared to the other LCDs around it.